when purchasing their new home with e-Starr Realty. Please know that buying or selling a home is indeed a difficult and tiring process. Our search for our new home was lengthy, complicated and full of diverse obstacles. Jason was and remains a very valuable asset in our search and eventual purchase of our new home. His seemingly complete understanding of each roadblock we encountered was comforting and helped us to relax in tense times. Jason is indeed a “jewel” of a broker with emphasis on feedback, timely communication and understanding many diverse situations. I would be happy to tell you more, and Jason has the authority to pass on my personal information to you for a more in depth conversation. If you are considering any other broker, you are indeed making a mistake. We would like to thank Jason for the outstanding job that he did with helping us find our camp on Merrymeeting Lake. He helped us over a few major obstacles with thoughtful advice and he has a vast network of local trades people that he was able to put us in touch with. I’m sure that our camp wasn’t the biggest deal that he did all year – but he certainly gave us “million-dollar” service. We would highly recommend Jason to anyone who is considering purchasing a home in the Lakes Region of New Hampshire. We wanted to thank you for all you have done to help us purchase our house in the lakes region. You listened to our needs, gave sage advice and we really felt like you partnered with us to ensure we bought the right home for us. We could not be happier with the house and we attribute this to your knowledge of the area, incredible network, and your willingness to go “above and beyond”. Your professionalism, demeanor, knowledge of the area is unmatched; you consistently went above and beyond and patiently answered our myriad questions. Everyone you recommended was courteous, professional and a pleasure to work with. You met and exceeded all of our expectations. It was truly a pleasure working with you and we recommend your service to anyone without reservation. In December of 2008 Trish and I decided to purchase a vacation home in New Hampshire. We learned of Jason Starr from listings on the internet and shortly after he produced many listings for us to look at. It wasn’t long before he understood exactly what we were looking for. This saved us countless hours looking at properties he knew wouldn’t suit us. Within a few weeks we closed on our new home and are now enjoying it. My family and I just recently sold a lake property and decided to purchase a new one on Lake Winnisquam. I learned of Jason Starr from listings on the internet and contacted him immediately. Right away, he started sending multiple listing for me to look at while weeding out the homes he knew were not an option for my family. This saved us from looking at many properties and focusing only on the ones we had a true interest in. Jason found us numerous homes and was able to get showings promptly. He was very professional and always had our best interest in mind. We just closed on a beautiful home and were very pleased with our experience. Jason is a great source of knowledge combined with many years of experience. He is very attentive to his customers and his reputation stands on its own. When we casually mentioned we were interested in a purchasing second home on “The Big Lake”, a wise a trusted friend immediately offered your name with strong recommendation. We are completely indebted to him and you, because, from that moment, the dream making wheels went into motion. From our first phone conversation, you felt like an old friend. You listened well and seemed to quickly understand our wants and needs, recognize the difference, and put together numerous trips to show us the best available properties that helped us better understand our wants and needs. You were always accessible and accommodating, making it feel like we were looking for property just around the block, not 100 miles away. Ultimately, you brought us to the perfect property. Then you put on a different hat and expertly managed our progress through the purchase process. You offered excellent and valuable advice through the negotiation phase, helping us to understand the sellers’ motivation which was key to reaching that elusive win-win agreement. You then kept us on schedule for closing, helping us find a quality mortgage broker and ensuring all information was available and communicated on time. You were truly a full service partner in this project. Thank you so much for your effort on our behalf. We truly appreciate it. When you’re out “on the neck”, stop in for visit. It’s always nice to see you. 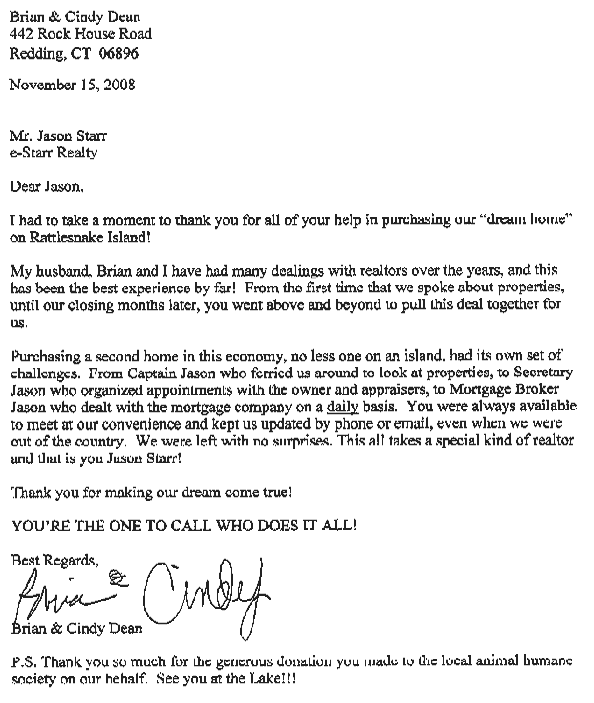 My husband & I couldn't have asked for better than having Jason for a real estate agent. From the 1st phone call to getting around his web site, Jason was very informative about the houses and lakes that we looked at. Any questions we had Jason had the answers, if not he would find them in a very timely manner. waterfront according to New Hampshire rules. need arises again to call on him again. Buying a second home was a huge deal to us. There were many factors to consider, grown sons, a young daughter and a family pet. Jason listened to our concerns and spent many hours with us. His knowledge of the area in and around Laconia was extremely helpful. He never wasted our time with listings not suited to our needs. On the other hand, he was always there for us when we wanted information or to see properties. We ended up with the perfect place for us, we love it!! We would recommend Jason Starr (e-Starr Realty) to anyone interested in buying in the Lakes Region. A belated thank you from us for all your hard work on our behalf. We are thoroughly enjoying our new home on Lake Ossipee. Dan says your website is far superior to any he searched and he searched them all. Your site had more listings than any other and was by far the easiest to navigate. Thank-you for your willingness to travel the entire state of NH to show us any listing we thought we might be interested in. We appreciate you sharing your extensive knowledge of the areas the properties were located in. We never felt any pressure from you, just knowledgeable guidance.